Business Development and Strategic Planning are key. The foundation of an effective solution is to have a clear understanding of your needs and goals. We focus on understanding your goals so we can tailor highly effective marketing solutions that are in line with your budget, meet your timeline, and support your objectives. At your invite, Bedrock Media will come to your office. Our presentations are full charisma and energy while introducing marketing solutions that will actually pay for themselves. We teache our clients how to become Marketing Specialists by utilizing the advances in video technology. We come to you. Our mobile crew of professionals and all their Video equipment will be set up in your office or a location nearby. We will bring you to the sunny Tampa Bay area for our fly-in program. We pick you up then take you to the Westin on the Bay. The following day is all yours to shoot the VIDEO package of your choice. 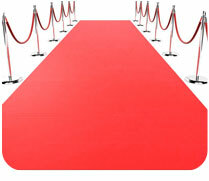 Have you ever had the red carpet rolled out for you before? Our goal is to effectively graft marketing strategy with new media and technology to create a comprehensive, integrated experience to grow your business.